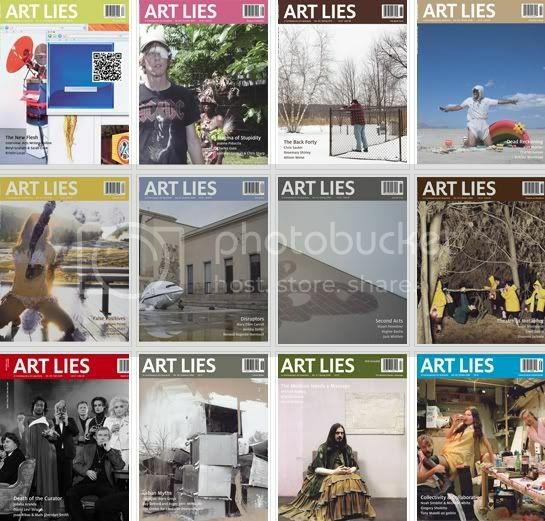 It is with sincere gratitude for your support over the years that we announce that Art Lies will cease production and publication of our printed journal and website content as the organization enters a period of hiatus and reflection beginning in May 2011. We look forward to completing our scheduled projects for spring 2011, including publication of the print and online editions of our upcoming issue, No. 68, “Architecture Is Not Art,” featuring Mary Ellen Carroll as Guest Editorial Contributor, and production of a special print-on-demand edition and public panel on April 16 in collaboration with the 2011 Texas Biennial. The Board of Directors’ decision has not come lightly. Print criticism, an increasingly precarious enterprise with the advent of digital media, has come to a crux in recent times. We have been fortunate to maintain a consistent and uncompromised output, responding to the changing dynamics of our field and readership with a diversified media presence. Today, facing the nationwide decrease in arts funding, our efforts have proven financially unsustainable. We are proud of the distinguished organization Art Lies has become over the last seventeen years. To think of how we began as a local, grassroots photocopied publication and grew to produce an internationally circulated, multiplatform journal with a unique voice speaks to the hard work and dedication of many individuals over nearly two decades, including our contributors, Editorial Advisory Board, staff, advertisers, vendors and stakeholders. We are proud to call Texas our home and are gratified to have played a key role in contributing to the growth of our local and regional art community. Through sixty-eight printed issues and related programming, we elevated recognition of Texas as a place where significant contemporary art is not only produced but also written about and discussed eloquently and professionally. We brought national attention and leading-edge ideas to Texas by inviting notable critics to Houston via the Art Lies Distinguished Critic Lecture Series, and by inviting eminent arts professionals to our pages via our Guest Editorial Contributor Program. Through commissioned writing and projects, we helped cultivate writers that we believe are the future of art criticism in this state and beyond. Your recent and encouraging generosity is allowing us to publish our spring/summer 2011 issue to the standards you have come to expect from Art Lies. We hope to see you at our Issue No. 68 / Bon Voyage Party! Please look for details on our website and in coming email newsletters. Our website will remain accessible during this period, and if you wish to contact us or purchase back issues, we will accommodate those requests through the website or by contacting our office. During our upcoming period of reevaluation and reimagining, we look forward to engaging with each of you—we welcome your thoughts and ideas regarding what Art Lies can and will become. We are extremely thankful to you all. I don't know what this means for the future of art criticism in the state. We have Glasstire (but I wish they would expand their criticism and long-form writings in general), we have Might Be Good..., and we have various staff and freelance reviewers at The Houston Chronicle and the Houston Press. But personally I still want to see more people writing--whether reviews in the classic sense, or longer pieces of criticism, or scene reports from flâneurs, or whatever. Let a thousand flowers bloom. Art Lies is Dead. Long Live Art Lies! Cheap thrills at DOMY's "Chisel Story Rust"
What Are Your Dreams Worth?